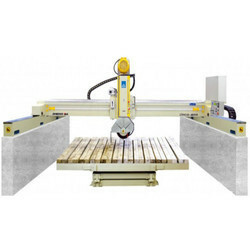 Providing you the best range of edge cutting machine with effective & timely delivery. 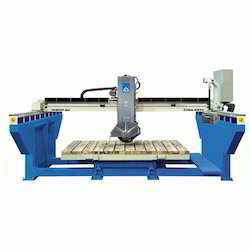 We are offering Edge Cutting Machine to our client. High Thickness Cutting up to 170 mm. 0-360 Degree rotating Work Table for angle cutting. 0-85 Degree tilting work table for easy loading-unloading of a slab. 0-45 Degree tilting cutting head for edge chamfering work. AC Drive in the main motor for RPM control according to the stone to be cut. Step cutting option for smooth cutting of high thickness & hard material stone. Complete Cast Iron Structure giving unrivaled long life, precision, corrosion resistance and acoustic benefits. 0-360 Degree rotating and 0-85 degree tilting table. 0-85 Degree tilting work table for easy loading-0unloading of a slab. High Thickness Cutting up to 120 mm. 0 & 90 Degree rotating cutting head for accurate and faster cutting. 0-85 Degree tilting work table for easy loading-unloading of slab. Optional whole structure of machine available to placed it before polishing line. Economic model for edge cutting work with concrete legs. Steel legs are also available as per customer demand. 0 & 90 Degree rotating Work Table.